Sister Susanna Yeung of Canossian Daughter of Charity, passed away peacefully on the afternoon of 25 October 2018, at the age of 71, at the Jesuit retreat venue, Xavier House, in Cheung Chau, just a few days after starting her month of Spiritual Exercises. 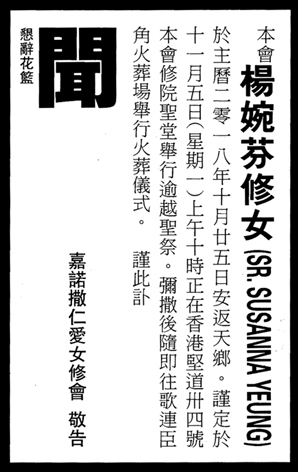 Born in Hainan, China, on 11 October 1947, Sister Yeung joined the Canossian religious family in Hong Kong in 1967 and made her first profession on 14 September 1970. In 1976, she graduated from the Chinese University of Hong Kong and went on to dedicate herself as a teacher at Pui Tak Canossian College, Canossa College, St. Mary’s Canossian College and as the principal, at the Sacred Heart Canossian Secondary School in Macau. Beginning in 1993, Sister Yeung followed a series of programmes in spirituality and received training for retreat direction in Rome, the United Kingdom, Canada and India, and had been serving as spiritual / retreat director both in Hong Kong and mainland China for many years. In 2016, she became the superior of Honeyville Canossian Retreat House, Pokfulam. Sister Yeung was a person with deep affection and sensitivity to God and to the human heart. This gift enabled her to understand the depth of the Holy Spirit in herself and in those who sought her direction. Many people, Catholics and Protestants alike, have been graced by her guidance. Her death was sudden, but she went peacefully to meet the Lord to whom she had dedicated her life with so much love and generosity. The Canossian Sisters are sure the Lord has found her ready for her reward and has received her immediately into His embrace, and wish to thank readers, relatives and friends for their prayers for the repose of her soul.